Give yourself the gift of transformation, self centering and happiness and connect to the unique energies of Assisi. 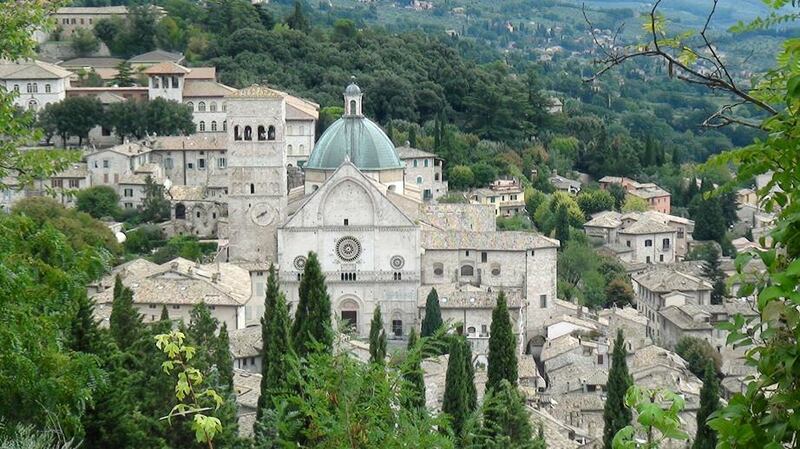 The pilgrim town of Assisi, built of pink stones, is located on a hill near the Monte Subasio. The wide view into the lowlands opens our limited everyday look. The Holy Pilgrim places from Francis and Clare of Assisi inspire and support our own experience of meditation and the gentle, silent hills nourish the soul and the heart and bring us back in touch with the beauty of life. The week of retreat and meditation in Assisi helps the participants to return to their inner source of wisdom, joy and life’s simplicity. Vacation from everyday life and the slip-in into the deep silence and nurturing power of Assisi, align ourselves again to live our lives with gratitude and recognition of the essential. Thus, the view gets wide and open to the possibilities and transformation that lie before us. The vacation retreats in Assisi offer you the experience to step deeply into the mystery of life and of your own existence. It is an intense experience that enables huge development and realization steps in life. Again in 2019 (exact dates to follow) Register now…. The Assisi retreat takes place ones a year. There is also the possibility to book individual retreats for individuals and couples between 4-10 days. Request information via email. The retreat begins at the arrival day at 7 or 8 pm – depending on the arrivals of participants – with evening meditation and ends the departure day after morning meditation at 10 am. Daily heart centering meditation at special places in Assisi and in the surrounding nature, leads you into the experience of returning home into you. In addition to daily meditation, there are still meetings, satsangs, movement meditation and group excursions. Every day there are also plenty of time for yourself and to explore Assisi and the surrounding area. Individual sessions (holistic coaching) can be booked individually during your stay. Plus individually booked accomodation (around 120-250 Euros depending on your wishes). Accommodation is self-organized. We are happy to help with the booking. In Assisi, there are numerous Hotels, inns and monastery rooms, so that for “every purse” is a place to find. Our recommendation is to book in the guest house close to the upper borders of Assisi. This guest house is a former monastery and is off the tourist paths. It has simple and very quiet rooms and a small kitchen for self-catering. A beautiful terrace with views of Assisi and a flower-filled garden courtyard provide additional comfort. The arrival organize the participants individually. There are cheap flights with Airberlin (Rom or Florence), Easyjet (Rom) and Ryanair (Perugia). From Rome and Florence to Assisi there is a convenient train connection. A taxi or the bus covers the final journey to Assisi town. From Perugia airport you can take a taxi to Assisi (around 30 Euros). You register through the registration form. No words could express my gratitude for the beautiful time we spent together! I enjoyed every minute of my stay in this blessed place. Katharina was an angel. A shining light. Peace and love can be found there. It is very difficult to describe my experience because it is in my heart and soul. I wish I could stay longer and I certainly will go back…I want to express my gratitude! The retreat was AMAZING. You have helped me so much! I have felt so much healing here with you! You are a very special person with a very special gift. You are knowledgable, kind, helpful and very funny. Just an overall joy to be around. Thank you for sharing. Please accept our hearfelt thanks for creating such a wonderful retreat. I for one will hold it in a special place in my heart forever. I thank for all you have given to us, your time, your teachings. A beautiful awakening! It was like an opening doors to me and to the others… I’m thinking of going back, but don’t know when yet. So you see, Katharina, you open that door that needed to be open, and I intend to proceed! I wish you plenty of happy moments and peace.